Professional Deleted Picture Recovery application is efficient enough to get back all kinds of data lost due to human error or disaster strike in digital storage media successfully. Quality and affordable Deleted Picture Recovery utility restores missing jpg, gif and other formats images from branded memory card like Sony, HP, Canon, SanDisk etc. Useful image recovery solution retrieves lost mp3/mp4 songs as well as wedding video clips from corrupted phone memory card in simple steps. Automatic photo recovery tool repair inaccessible photographs, videos from bad sector of micro SD and MMC card quickly. â�?�¢	Proficient picture recovery software retrieves deleted mp3/mp4 songs and videos from mini SDHC plus card successfully. 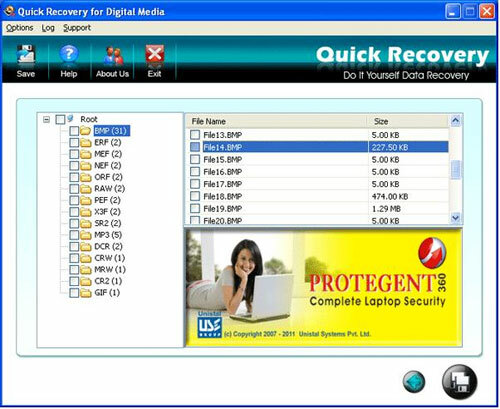 â�?�¢	Advanced image recovery tool has simple GUI interface to recover damaged multimedia data from digital storage devices. â�?�¢	Resourceful photo recovery program runs on latest Windows OS and rescue undetectable png, jpeg images from micro SD card accurately. EZ Backup Gadu-Gadu Basic makes it easy to backup your Gadu-Gadu message history, skins, contacts, emoticons and settings to any local, network or removable drive. 4Easysoft ePub to iPhone Transfer can easily help users transfer ePub files to iPhone directly or export some ePub format contents in iPhone out to some other storage devices.